It’s hard to imagine an Avril Lavigne without Joan Jett. Or a Gwen Stefani, Shirley Manson or Courtney Love. 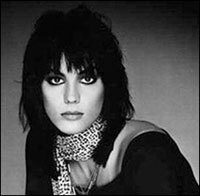 Jett, Chrissie Hynde, Pat Benatar and Debbie Harry are the names that come to mind when I think of women who were pioneers of rock. But Jett is the one I consider most fondly, because I have great associations with this song, her biggest hit. The allmusic biography of Jett lists 17 contemporary acts she has influenced. Almost every one is a woman. The same article lists 21 artists who influenced Jett, and every one is a man. Funny how you can look at two lists like that and see in an instant what it means to be a trailblazer.